You can get tickets when you buy a Kimmel Center season subscription. 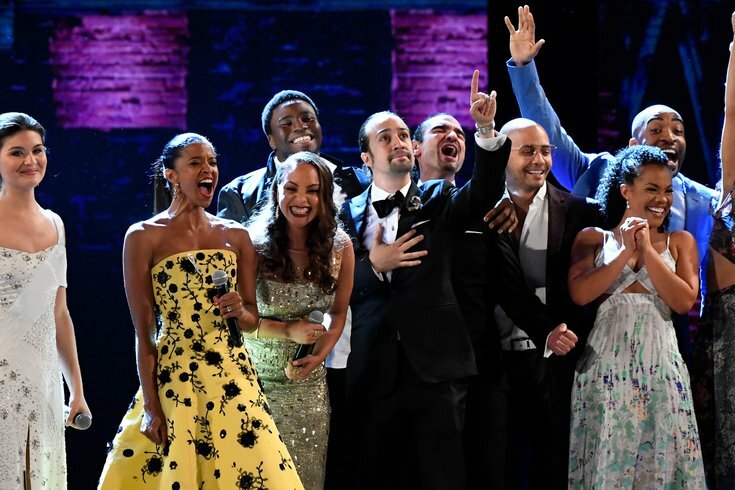 June 12, 2016; New York, NY, USA; The cast of "Hamilton" close out the 70th Tony Awards after winning Best Musical during the 70th Tony Awards at the Beacon Theatre. It has been more than a year since we found out “Hamilton,” Lin-Manuel Miranda's hip-hop musical about the stud on the $10 bill, was officially slated for Philadelphia during the Broadway show’s national tour. Now the official dates of its run at the Forrest Theatre have been unveiled, and they’re going to call for even more waiting … this time, until August 2019. “Hamilton” is scheduled for a 12-week run, beginning Aug. 27 until Nov. 17 of next year. If its hard-to-get tickets for the New York production are any indication, nabbing a seat in Philly is likely to be a tricky (and often expensive) affair. Individual tickets for the production itself aren’t being sold on their own yet; instead, if you want to secure a seat right now, you need to purchase an entire season subscription, which will give you tickets to both “Hamilton” and a handful of other productions headed for Philly. If you’re interested in more modern productions not unlike “Hamilton,” there’s one option featuring tickets to “The Book of Mormon” and “Rent,” among others. Specific pricing information and dates will be available 9 a.m. Friday when the tickets go on sale here. Tickets for just “Hamilton” will be available later, but no date has been specified yet.